Powers/Abilities: An expert juggler who specializes in handling balls filled with deadly substances (including acids, explosives, and fire), Oddball is accustomed to juggling objects of various sizes and hurling them with expert precision. (Hawkeye I#3 (fb) - BTS) - A famous juggler, Oddball decided to begin a life of crime as a costumed juggler with a deadly arsenal of weaponized balls. (Hawkeye I#3) - Oddball and Bombshell waited for Hawkeye and Mockingbird to enter the apartment and watched it explode. They soon learned that the heroes somehow survived. They later lured the duo into a trap by tossing a ball at Hawkeye in the subway tunnel. Mockingbird batted aside most of Oddball's thrown balls, but one hurt Hawkeye's wrist. Bombshell, dressed as a nun, hit Mockingbird with her wrist-bomb launcher. She changed into her costume just before Mockingbird attacked, kicking Bombshell in the face before Bombshell took her down with another blast. Oddball threw fire balls and bomb-balls before rushing onto the subway to avoid Hawkeye's arrows. He took a hostage on the subway, then hit the man in the head when he got obstinate before running again. Hawkeye's arrow managed to dislodge half of Oddball's ammunition as Oddball ran into the subway heights. 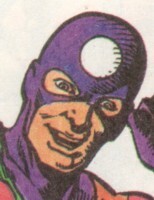 Hawkeye briefly restrained Oddball's arm with a bola arrow, and caught up to Oddball as he was freeing himself with an acid-filled ball. Just as Hawkeye nearly defeated Oddball, Bombshell hit the hero with a small explosive. They took Hawkeye and Mockingbird back to Crossfire. (Captain America I#317) - The Death-Throws waited for Crossfire, who was being escorted into the courthouse by the police. They threw gas bombs at the crowd and hit the cops with tossed weapons. As the crowd choked, the jugglers donned gas masks and gave one to Crossfire, easily escaping with him and blowing up a cop car on their way out. When they arrived back at their warehouse headquarters, the Death-Throws realized that Crossfire couldn't pay them Furious, they made Crossfire stand in the middle of them as they juggled and tossed deadly devices at each other, which would have killed him if he moved. They decided to use him as bait for Hawkeye, who they figured they could auction off to the Avengers. The Death-Throws set traps at an abandoned railroad station and sent a message to Hawkeye through Captain America's hotline. Hawkeye soon entered with Captain America's shield and they nearly trapped him under a steel mesh net, but Captain America entered and fired flare arrows, lighting the room up and giving Hawkeye time to escape. The Death-Throws attacked, throwing their various weapons, but were swiftly defeated. Oddball, who'd been trapped under adhesives, confessed their crimes to Hawkeye. (Dr. Doom's Revenge (comic) (fb) - BTS) - Oddball was recruited by Dr. Doom as part of his Doom's Brigade, a group of super-villains who would oppose any superheroes who tried to prevent his plot to threaten New York with a stolen Thermo C4VG missile. (Dr. Doom's Revenge (comic)) - While Doom's Brigade waited to be given someone to fight, they began brawling amongst themselves. Oddball faced off against Boomerang, but Doom broke up the melee, informing them that they were there to serve him and would do only as he commanded. (Dr. Doom's Revenge (game)) - When Captain America and Spider-Man infiltrated Doom's castle, Oddball opposed and was defeated by Captain America. (Captain America I#395) - At the Bar With No Name in Manhattan, Oddball played a game of pool against 8-Ball. (Guardians of the Galaxy I#28) - Doctor Octopus recruited a new Masters of Evil team to break into Avengers headquarters. Though the Avengers were gone, the Guardians of the Galaxy were present. Oddball threw his special balls at Talon, who easily evaded them and knocked Oddball out by kicking him and tossing him into Powderkeg. (Captain America I#411) - Oddball traveled to the AIM Weapons Expo on Boca Caliente. He and the Trump were checking into the hotel when Crossbones (secretly Captain America). Later, he watched, alongside dozens of other criminals, a bout between "Crossbones" and Mad Dog, Ramrod and Sumo. (Hawkeye: Earth's Mightiest Marksman#1) - Hired by Albino to kill Hawkeye, Oddball posed as Detective McBain at a local jail. Hawkeye arrived with Justice and Firestar to see the prisoner Batroc, who had already been freed. As they walked in, Oddball set free al the prisoners and revealed his true identity as he changed into costume. Juggling gas bombs, stun grenades, electro-zappers, and more, Oddball managed to catch all of Hawkeye's fired arrows and tossed them back at Hawkeye. Justice then telekinetically lifted Oddball into the ceiling, knocking him out. (Wolverine II#167) - Oddball participated in Madripoor's Bloodsport competition. He fought against Headhunter, who seemingly killed Oddball with one blow. Oddball received an entry with the Death-Throws in Official Handbook of the Marvel Universe Deluxe Edition#3. Thanks to Markus Raymond for adding Oddball's appearance in Captain America I#395. Another costumed Oddball (Orville Bock) has joined the Death-Throws @ Union Jack II#2.